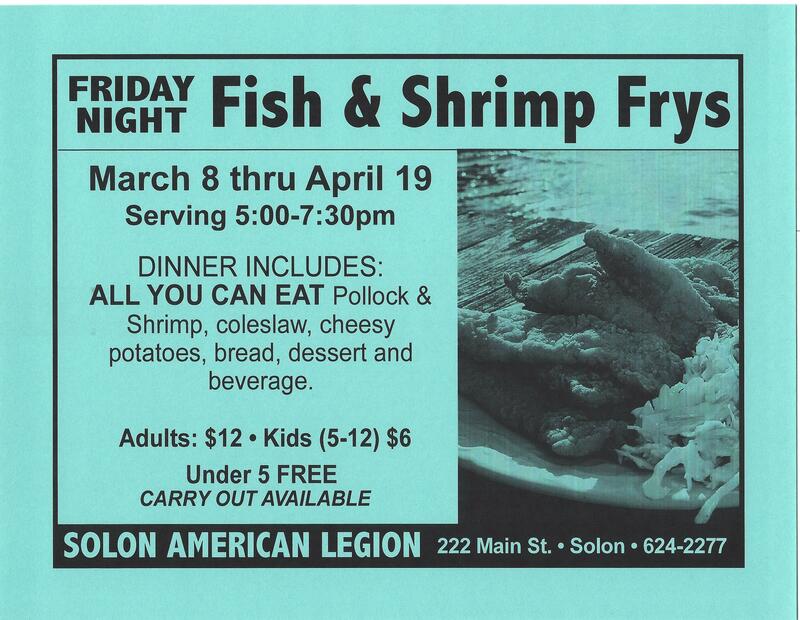 This Friday all proceeds of the 50/50 drawing will be going to the Solon Legion Riders. The ‘Riders’ have ongoing donations to the Solon Food pantry, Secret Santa, and this year are covering 1/2 the cost of a new ice machine at the Legion. We appreciate the overwhelming support everyone has shown the first four weeks. We have now figured out the amount of fish and are ready to serve everyone! As always wear RED every Friday to show your support to all our deployed troops around the world! Come early and enjoy the best fish & shrimp dinner in the area! LENTEN FISH DINNER START MARCH 8TH. IS BEHIND THE BAR. PLEASE SIGN UP, WE NEED YOUR HELP! It looks like winter is about to leave us and soon the warm breath of spring will be here. People will emerge from their winter hibernation. Neighbors will once again be visiting with each other as they prep their yards. They will talk about the harsh winter and their respective plans for the warm weather. Farmers will be busy preparing their equipment as they get ready for the spring planting. March is also a time when Christians prepare themselves for the greatest of holy days, Easter. Christians use this time of Lent to reconcile with our Lord through various ways. For some it is a solemn time built upon the promise of great joy. The joy of our risen Lord Jesus. I encourage all of you to take this season of preparation and reflect upon the sacrifices our veterans and current men and women of our military have given to this great nation of ours. Remember, they have served or are serving to protect our freedoms. We don’t ask for praise but we will always accept a silent prayer of thanks.